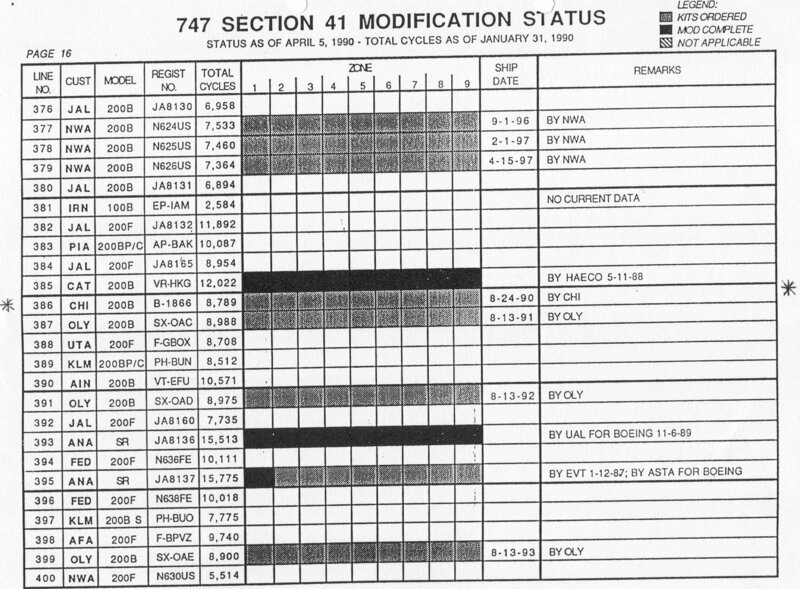 This diagram shows when China Air 611 was scheduled to have major repairs conducted on Section 41, the cockpit. China Air 611 crash - no survivors. On May 25, 2002, China Air CI 611 broke into four pieces at its cruising altitude of 35,000 feet with a loss of 225 people. The cockpit voice recorder and flight data recorder have revealed little. There are several 'thumps' on the CVR. These noises are explained in my book. I believe this disaster was caused by metal failure of key parts of the structure of Section 41 - the cockpit. This Boeing 747-200B aircraft was manufactured in 1979. It was Line # 386 and had a tail # of B1866. Problems with metal fatigue began in the late 1980's and parts were ordered in 1990. We do not know if any repairs had taken place. Modification requirements shown below. Search these sites for details. In the aviationnow website, you will find the following article - "Flight 611 probe finds likely rear fuselage fatigue cracks". Also check out in the last paragraph of this article wherein it is stated that the 747-200 "has a known fatigue weakness in the nose Section 41, but records show the accident aircraft had that area reinforced at least 10 years ago." The question becomes, "Were all of the fatigue problems in Section 41 reinforced at that time?" The cockpit voice recorder and flight data recorder have been retrieved from the wreckage of CHINA AIR 611. I have found information on the debris field from the official government site in Taiwan. When I get permission, I will post this information this webpage and I will discuss my interpretation of what happened to China Air 611 which it broke up in mid-air.